Hepatocellular carcinoma (HCC) is the second leading cause of cancer-related death worldwide. The disease recurrent rate is relatively high resulted in poor 5-year survival in advanced HCC. Cancer stem cells (CSCs) have been considered to be one of the main mechanisms for chemoresistance, metastasis, and recurrent disease. Interferon-induced protein 44-like (IFI44L) gene is a type I interferon-stimulated gene (ISG) and belongs to the IFI44 family. Previous reports indicated antiviral activity against HCV in IFI44L, however, its precise role and function in HCC has not been unveiled. To explore the characteristics of hepatic CSCs, we successfully enriched hepatic cancer stem-like cells from three established liver cancer cell lines (Hep3B, HepG2, and PLC lines). Parental Hep3B and HepG2 cells and their sphere cells were treated with doxorubicin for 48 h and cell viability was measured by MTT assay. HCC tissue blocks from 217 patients were sampled for tissue microarray (TMA). Follow-up information and histopathological and clinical data including age, gender, tumor grade, advanced stages, HBV, HCV, tumor number, tumor size, relapse-free survival, and overall survival were obtained from the cancer registry and medical charts. The liver TMA was evaluated for IFI44L expression using immunohistochemical staining and scores. These hepatic cancer stem-like cells possess important cancer stemness characteristics including sphere-forming abilities, expressing important HCC cancer stem cell markers, and more chemoresistant. Interestingly, we found that overexpression of IFI44L decreased chemoresistance towards doxorubicin and knockdown of IFI44L restored chemoresistance as well as promoted sphere formation. Furthermore, we found that depletion of IFI44L enhanced migration, invasion, and pulmonary metastasis through activating Met/Src signaling pathway. Clinically, the expression level of IFI44L significantly reduced in HCC tumor tissues. Low expression of IFI44L levels also correlated with larger tumor size, disease relapse, advanced stages, and poor clinical survival in HCC patients. Taken together, we first demonstrated that IFI44L is a novel tumor suppressor to affect cancer stemness, metastasis, and drug resistance via regulating Met/Src signaling pathway in HCC and can be serve as an important prognostic marker. Liver cancer is the fifth most common cancer worldwide and the second leading cause of cancer-related death worldwide . In primary liver cancers, most (70 to 90%) cancers are hepatocellular carcinoma (HCC) . The treatment efficacy of HCC is rather low mainly due to chemoresistance and metastasis which resulted in poor 5-year survival of less than 5% in advanced HCC . Cancer stem cells (CSCs) are considered to be one of the main mechanisms of chemoresistance and metastasis [3–5]. 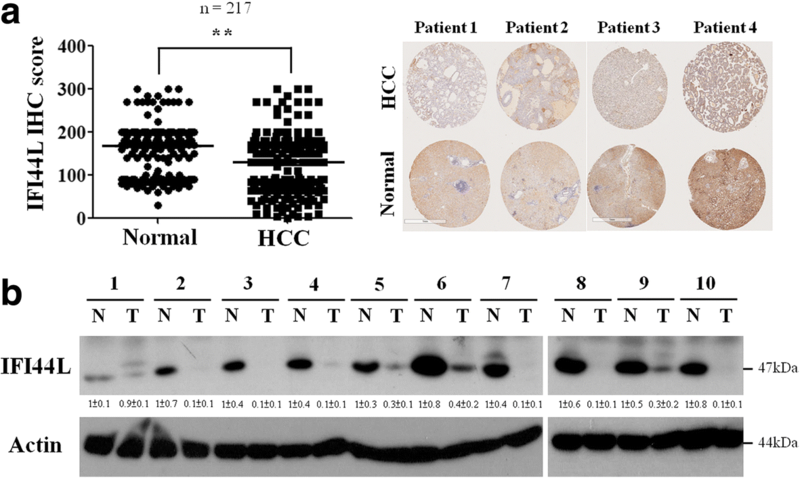 Hepatic CSCs have been identified and isolated from HCC in previous reports [2, 6–8]. To elucidate potential targetable molecular markers as well as signaling pathways of hepatic CSCs will be helpful in improving treatment efficacy in HCC. Hepatitis B virus (HBV) or Hepatitis C virus (HCV) are hepatotropic, noncytopathic DNA viruses that cause acute and chronic necroinflammatory liver diseases and hepatocellular carcinoma . Type I interferons (IFNs) are pro-inflammatory cytokines that activate JAK-STAT signaling pathways leading to transcription of IFN-stimulated genes (ISGs) to protect cells against invading viral pathogens including HBV and HCV [10–14]. Although hundreds of ISGs have been identified for the past decades, only a few have been characterized with antiviral activity. Using an overexpression screening approach, 380 human ISGs including interferon-induced protein 44-like (IF144L) gene were tested for their abilities to suppress the replication of viruses . IFI44L is a type I ISG and belongs to the IFI44 family . The IFI44L protein is 452 amino acid long, an approximately 47 kDa protein, and located on chromosome 1 at area p31 (GenBank AB000115). Increased expression of IFI44L was reported after treatment with IL-28A and IFN-α to inhibit HCV replication . In addition, the functions of miR-9 in some cancers are recently implicated in regulating proliferation, invasion, metastasis, epithelial–mesenchymal transition (EMT), apoptosis, and tumor angiogenesis [17–19]. A previous study reported that overexpression of miR-9 significantly upregulated the expression of a lot of ISGs including IFI44L in nasopharyngeal carcinoma cells . These studies indicated the promising role of IFI44L not only in anti-viral aspects but also in cancer treatment. An earlier report documented that a novel ISG, BATF2, as potent negative regulator of hepatocyte growth factor (HGF)/Met signaling in colorectal cancer and may serve as a prognostic tumor marker . IFN-α activates STAT signaling and downregulates Met in primary human hepatocytes was also reported . Blocking the HGF/Met pathway by Met inhibitors or monoclonal antibodies strongly inhibits tumor growth and tumorigenicity in many malignancies including HCC . Met has been known that is an upstream regulator of multiple pathways, including PI3K/Akt, Ras/MAPK, Src/Stat3, and NF-κB . In liver cancer, many studies have demonstrated that Met overexpression is associated with the development of distant metastases and a shorter metastasis-free survival . Consequently, Met activation is considered to be crucial for the acquisition of metastatic potential and the correlation between Met pathway and ISGs warrants further study. In this study, we successfully enriched hepatic cancer stem-like cells and first identified that overexpression of IFI44L significantly reduces the chemoresistance towards doxorubicin and knockdown of IFI44L promotes sphere formation in HCC cells. Furthermore, we found that depletion of IFI44L expression promotes migration, invasion, and pulmonary metastasis in HCC cells. We first demonstrated that suppression of IFI44L leads to activation of Met/Src pathway. We also first identified that the expression of IFI44L decreased in tumor tissues and correlated with several poor clinical outcomes in HCC patients. Our data demonstrated that IFI44L is a potent negative regulator of Met/Src signaling pathway in modulating HCC cancer stemness and drug resistance and may serve as an important prognostic marker. 217 HCC tissue microarray slides were obtained from HCC patients receiving surgeries in Changhua Christian Hospital from July 2011 to November 2013 . Paraffin-embedded HCC samples were obtained from Changhua Christian Hospital under the approved Institutional Review Board (IRB) protocol. Clinical patterns and overall survival data were analyzed by SPSS software and chart review. The age of all patients was between twenty-nine and eighty-one years. The clinical characteristics of these 217 patients are shown in Table 1. The human liver cancer cell lines Hep3B (ATCC number: HB-8064), HepG2 (ATCC number: HB-8065) and PLC (ATCC number: HB-8024) were obtained from the American Type Culture Collection (ATCC, Manassas, VA). All cells were cultured at 37 °C under 5% CO2 in Dulbecco’s modified Eagle medium (DMEM; Invitrogen) supplemented with 10% fetal bovine serum (FBS; Biological Industries) and 100 units/ml of penicilium and streptomycin (Life Technologies, Carlsbad, CA, USA). For IFI44L-expressing vector, IFI44L coding sequence was amplified and cloned in pMSCV plasmid. Antibodies for western blotting and immunohistochemistry (IHC) are anti-IFI44L (Abcam), p-Met (Cell signaling, Tyr1234/1235), Met (Cell signaling), Src (Cell signaling) and p-Src (Cell signaling, Tyr416). IFI44L-specific siRNAs were purchased from MDBio, Inc. Detailed sequences for IFI44L siRNA oligonucleotides were shown in Additional file 1: Table S1. For cell sensitivity assays, HCC cells were pretreated with doxorubicin (Sigma-Aldrich) for 18 h (overnight) in serum-free culture medium. Quantitative RT-PCR (qRT-PCR) was used for gene detection. Detailed procedure of reverse transcription reaction was described elsewhere . qRT-PCR was performed on a CFX96 qPCR detection system (Bio-Rad) with a 1:10 dilution of cDNA by using KAPA SYBR FAST qPCR Kits (KAPA Biosystems). The mRNA levels were normalized to actin mRNA. The primers used for mRNA expression are listed in Additional file 1: Table S1. Monolayer cells of three HCC cell lines (Hep3B, HepG2 and PLC cells) were cultured in a stem cell selective condition described previously to obtain spheres . Spheres comprised at least five cells were calculated by visual counts according to a previous report . The cell proliferation assay was measured by MTT assay (Promega, Madison, WI, USA). The assay was performed according to the manufacture’s protocol. Briefly, cells (with density around 3 X 103 per well) were seeded in 96-well plates and were incubated for 24 h. Cells were subsequently treated with various concentrations of doxorubicin and then were incubated for 48 h. Viable cells with active metabolism converted MTT into a formazan product, the quantity of which was measured at a wave length of 490 nm with 96-well plate reader and was directly proportional to the number of viable cells. The drug concentration required to reduce proliferation by 50% is defined as IC50. All the experiments were performed in triplicates and repeated three times. Migration and invasion abilities of HCC cells were carried out using the Falcon Cell Culture Inserts with or without Matrigel (BD Biosciences) coating as described previously . Detailed procedures were described elsewhere . Hep3B Cells (1 × 106) with indicated treatments were suspended in phosphate-buffered saline (PBS) and were injected individually into the tail vein of 6- to 8-week-old C.B-17 severe-combined immunodeficient (CB17-SCID) mice. All mice were monitored meticulously and were sacrificed after 40 days of implantation. Tumor growth was observed by live animal BLI (Caliper IVIS system, PerkinElmer). IHC was performed to detect IFI44L expression from paraffin-embedded HCC specimens. The slides were stained with anti-IFI44L antibody (Bethyl Labs, Montgomery, TX, USA) . The IFI44L antibody was purchased from ThermoFisher (Rock, USA). In liver cancer specimens, the detailed scores for IHC were defined as described previously [24, 29]. The SPSS software (Version 13.0 SPSS Inc., Chicago, IL, USA) was used to conduct Chi-square analysis and paired-samples t-test. Kaplan-Meier method was performed for analyzing survival data. Variables related to survival were analyzed using Cox’s proportional hazards regression model via SPSS software. Differences between experimental groups were calculated using the Mann–Whitney U test. Differences with P values of < 0.05 are considered statistically significant. In order to enrich for CSCs, parental Hep3B, HepG2, and PLC cells from monolayer were cultured in a stem cell selective condition described in ‘Methods’ to form spheres. Most of the suspended cells underwent apoptosis during the first 2 days of culturing, and the rest of survived cells gradually formed floating spheres. The spheres grew larger and often reached to 50–100 μM in diameter after 4–8 days (Fig. 1a). Overexpression of mRNA of HCC cancer stem cell markers was found in. Hep3B sphere cells compared with their parental cells. These cancer stem cell markers, including CD24, CD44, CD117, CD133, ALDH, ABCG2, OCT4, and Nanog, were significantly higher in Hep3B sphere cells shown by qRT–PCR analysis (Fig. 1b) [7, 30–37]. Next, we examined the chemosensitivity of these sphere cells. Parental Hep3B and HepG2 cells and their sphere cells were treated with doxorubicin for 48 h and cell viability was measured by MTT assay. 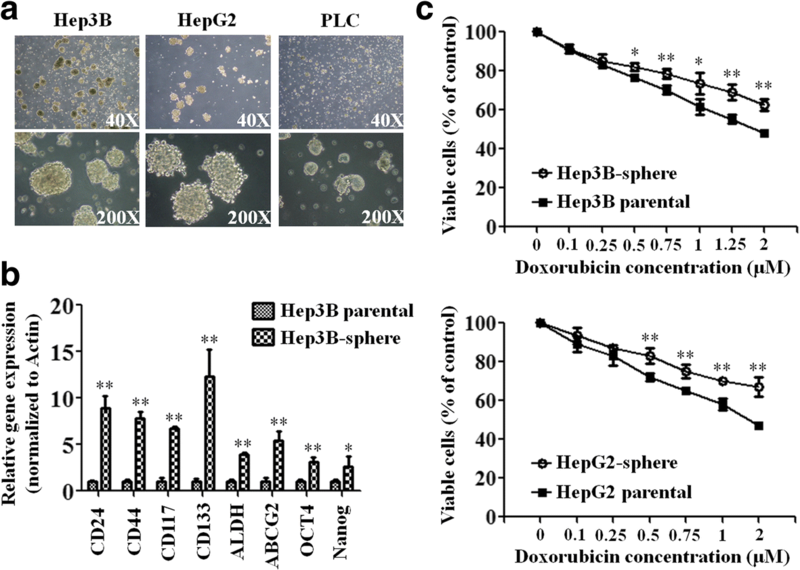 Hep3B and HepG2 sphere cells are found to be more chemoresistant to continuous exposure to various concentrations of doxorubicin (Fig. 1c). Thus, we have successfully enriched HCC cancer stem-like cells from Hep3B, HepG2, and PLC lines displaying cancer stem cell characteristics including sphere-forming, expression of HCC cancer stem cell markers, and more chemoresistant in accordance with established parameters of cancer stem-like cells [38–40]. Since IFI44L was implied to be correlated with cancer , we then investigated the impact of IFI44L on drug resistance. Cells transfected with IFI44L expression plasmid or control plasmid were tested their protein expression of IFI44L to confirm the transfection efficiency. Western blotting showed upregulation of IFI44L protein level in Hep3B and HepG2 cells after transfection with the expression plasmid of IFI44L (IFI44L vector) (Additional file 2: Fig. S1). Our data indicated that Hep3b and HepG2 cells became more chemosensitive to continuous exposure to different doses of doxorubicin after transfection with IFI44L vector (Fig. 2a), whereas IFI44L knockdown restored their chemoresistance (Additional file 3: Figure S2). These data suggested that overexpression of IFI44L significantly decreased chemoresistance of HCC lines towards doxorubicin. To assess whether IFI44L level correlated with cancer stemness in HCC, we examined the protein expression level of IFI44L in HCC lines. 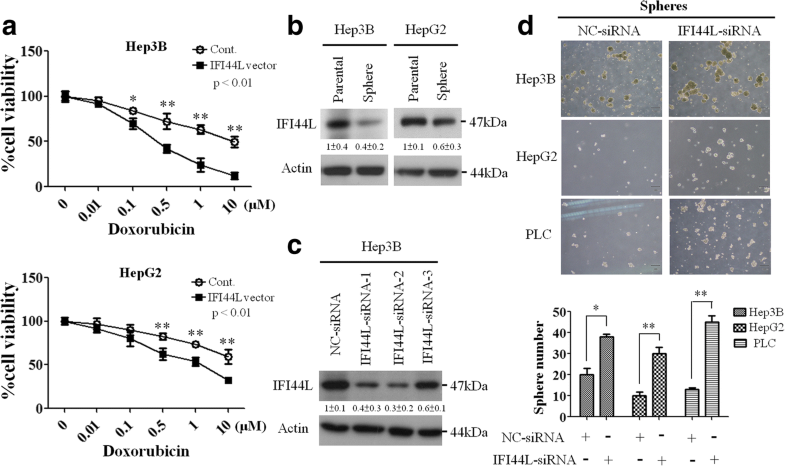 Decrease of IFI44L protein level in Hep3b and HepG2 sphere cells was found compared with their parental cells by Western blotting analysis (Fig. 2b). We then investigated if suppression of IFI44L by its small interfering RNAs (siRNA) could inhibit cancer stemness characteristics in HCC lines. Three specific IFI44L-siRNAs were tested for their inhibitory efficacy by analyzing the IFI44L protein levels in Hep3B, HepG2 and PLC cells, IFI44L-siRNA-2 showed the highest knockdown effect in inhibiting IFI44L protein and it was used in the subsequent experiments (Fig. 2c, Additional file 4: Figure S3). Next we tested whether sphere-forming ability of Hep3B, HepG2, and PLC lines could be promoted by knockdown of IFI44L. After 8 days culturing of Hep3b, HepG2, and PLC cells in the stem cell selective condition, sphere number was calculated by visual counting under microscope. Knockdown of IFI44L caused significant increase of sphere number (Fig. 2d). Thus, our data suggested that IFI44L may play as a tumor suppressor role in restoring chemosensitivity and affecting cancer stemness. Furthermore, we evaluate the tumor suppressor role of IFI44L in regulating cancer metastasis. 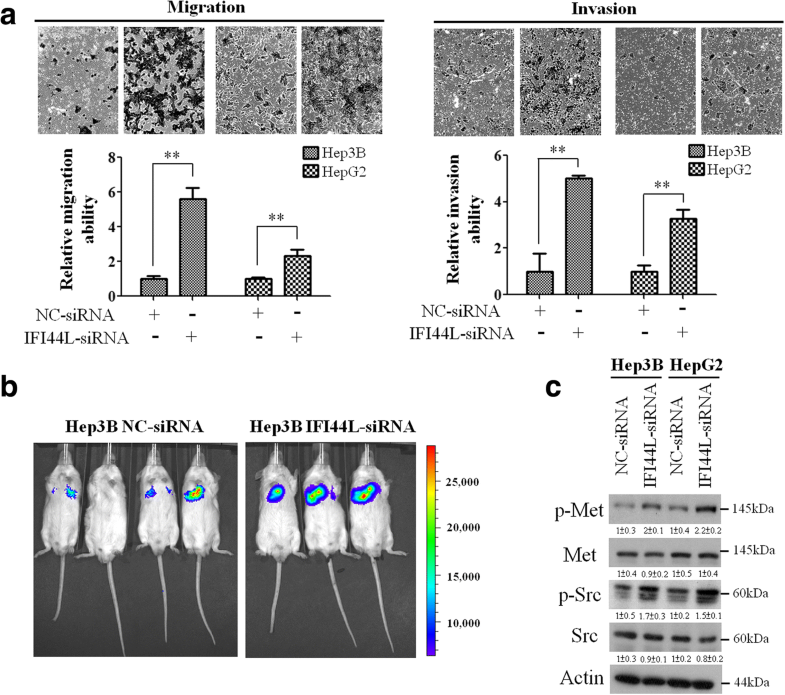 In Boyden chamber assay, we found that depletion of IFI44L expression significantly promotes Hep3B, HepG2 and PLC cell migration and invasion abilities (Fig. 3a and Additional file 5: Figure S4). To investigate whether IFI44L regulated cancer cell metastasis in vivo, we employed an experimental metastasis model via tail vein injection in SCID mice. In this model, knockdown of IFI44L significantly promoted lung metastasis of Hep3B cells compared with the control group (Fig. 3b). Since ISGs are implied to be correlated with Met pathway [11, 22, 23], we then explored the role of IFI44L in Met signaling pathway. By Western blotting analysis, we found that suppression of IFI44L enhances the phosphorylation of Met and Src in Hep3B and HepG2 cells (Fig. 3c). To further assess the role of IFI44/Met/Src axis in regulating cancer metastasis, we performed additional Western blotting analysis as well as migration and invasion assay. We found that overexpression of IFI44L decreased phosphorylation of Met as well as migration and invasion abilities in Hep3B cell line, whereas ectopic expression of Met reversed IFI44L-mediated inhibition of migration and invasion abilities approximately 50% (Additional file 6: Figure S5). Taken together, these findings reinforced that the functional role of IFI44L as a tumor suppressor and it could implicate in Met/Src signaling pathway in HCC. To evaluate the correlation of IFI44L with clinical samples, the expression of IFI44L in 217 pairs of normal liver and HCC tumor tissues were analyzed by IHC and Western blotting analysis. 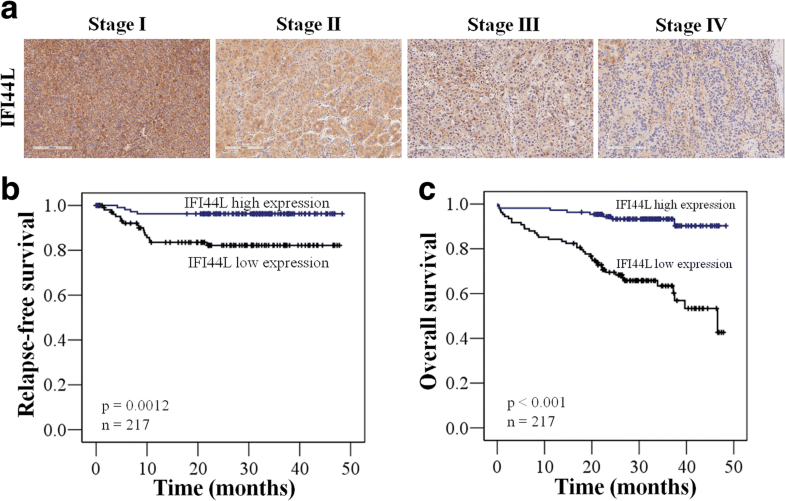 The IHC score of IFI44L was significantly higher in normal liver tissues compared with tumor tissues (Fig. 4a). Western blotting analysis also revealed that all of ten pairs of matched HCC tumor tissues expressed lower level of IFI44L in comparison with the matched normal tissues (Fig. 4b). Downregulation of IFI44L expression found in HCC tumor tissues is compatible with the tumor suppressor role in HCC we discovered above. Furthermore, the correlation between clinicopathological characteristics and IFI44L of these 217 patients were analyzed in Table 1. Among these parameters, age, gender, tumor differentiation, HBV surface antigen, anti-HCV antibody, and the tumor number were not significantly different in patients with low versus high expression levels of IFI44L (Table 1). However, low expression of IFI44L was observed in only 47% (84/180) of the early stages (stage I/II) HCC patents whereas 68% (25/37) of the late stages (stage III/IV) HCC patients expressed low levels of IFI44L (P = 0.029) (Table 1). IHC staining also confirmed that IFI44L protein level decreased markedly in advanced stages in HCC samples (Fig. 5a). Moreover, higher percentage of HCC patients with low expression level of IFI44L had larger tumor size then patients with high expression level of IFI44L (64% vs 36%, P = 0.002) (Table 1). Since CSCs are indicated to be associated with cancer recurrence [2, 38], our previous experiments also indicated that IFI44L affects cancer stemness in HCC cells. In clinic data, we also found that patients with low expression level of IFI44L had significantly higher relapse rate (81% vs 19%, P = 0.002) and shorter relapse-free survival (RFS) (p = 0.0012) than patients with high expression level of IFI44L (Table 1, Fig. 5b). In survival analysis, the influence of clinicopathological characteristics including IFI44L on patients’ overall survival (OS) was statistically examined by univariate analysis shown in Table 2. Four parameters including advanced stages, larger tumor size, disease relapse, and low expression of IFI44L are significant correlated with shorter median OS (P < 0.001) (Table 2). Kaplan–Meier survival analysis of these 217 patients also revealed that low expression level of IFI44L correlated with poor OS (P < 0.001) (Fig. 5c). These results suggested that downregulation of IFI44L expression levels significantly correlated with larger tumor size, disease relapse, advanced stages, and poor clinical survival in HCC patients and could serve as an important prognostic marker. HCC has been a global health problem with rising incidence in Western countries recently . In the West, around 40% of patients are diagnosed as early Barcelona Clinic Liver Cancer (BCLC) stages and are eligible for potential curative treatment such as surgical resection, radiofrequency ablation, microwave ablation, percutaneous alcohol injection, and liver transplantation [9, 41–43]. However, the probability of disease recurrence is around 50% within 3 years after successful treatment . Hepatic CSCs exhibit multidrug and radio-resistant properties and are considered as in part the main mechanism of chemoresistance and recurrent disease [2, 4]. In our study, we successfully enriched cancer stem-like cells via sphere-forming method in nonadhesive culture plates with serum-free culture medium from three hepatic cancer cell lines. These cancer stem-like cells express important hepatic CSC markers such as CD24, CD44, CD117, CD133, ALDH, ABCG2, Oct4, and Nanog which were extensively reported before [7, 30–37]. They also reveal significant chemoresistance towards doxorubicin in accordance with previous reports . To find specific molecules to target these cancer stem-like cells would be very important in treating HCC. Type I IFNs are a family of cytokines to directly activate the transcription of ISGs to exert anti-viral, anti-proliferative, and immunomodulatory activities [10, 11]. IFI44L, one of the type I ISG, exhibits a low antiviral activity against HCV and is indicated to be correlated with some cancer recently although the reports are scarce [12, 20, 44]. In present study, our data showed that overexpression of IFI44L restores chemosensitivity towards doxorubicin whereas decreased expression of IFI44L promotes sphere formation in HCC cell lines. Depletion of IFI44L also enhanced migration, invasion, and lung metastasis in HCC cells. According to the above results, IFI44L was proposed as a novel tumor suppressor modulating cancer stemness, drug resistance, migration and invasion, as well as pulmonary metastasis in HCC. Although one recent study indicated that upregulation of IFI44L was significantly correlated with shorter overall survival and shorter median survival time in pancreatic ductal adenocarcinoma , our data revealed that low expression of IFI44L was found in HCC tumor samples and was correlated with larger tumor size, more disease relapse, advanced stages as well as significant poorer RFS and OS. Although some study identified that IFI44L overexpressed in pancreatic ductal adenocarcinoma and correlated with worse clinical prognosis, this conclusion is only made from statistics of databases collecting from gene expression profiling and TCGA database but lacks in vitro and in vivo experimental confirmation . The functional role of IFI44L in different cancers still warrants further study. In advanced stages of HCC, conventional chemotherapy such as doxorubicin, cisplatin, and 5-fluorouracil were generally introduced but the response rate was very low (from 15 to 20%) and these chemotherapeutic agents failed to prolong survival [2, 41]. Sorefenib, a small molecule multikinase inhibitor that inhibits tumor-cell proliferation and tumor angiogenesis, is the first targeted therapy to reveal survival benefit in patients with advanced HCC . Other new molecular pathways including. Ras/Raf/MEK/ERK (MAPK) pathway, wnt/catenin pathway, PI3K/Akt/mTOR pathway, VEGF pathway, and HGF/Met pathway etc. were extensively explored in HCC patients [9, 23, 45]. The efficacy of new targeted therapies such as lenvatinib, nivolumab, ramucirumab, tivantinib, and cabozantinib etc. are still under evaluation in large clinical trials . Of the above mentioned pathways, the HGF/Met pathway has been implicated in tumor cell migration, invasion, proliferation, and angiogenesis . High expression of Met and HGF was reported to be correlated with early recurrence of HCC after hepatectomy and shorter survival in HCC patients . Several studies indicated that IFN regulates multiple STAT signaling and downregulates Met resulting in suppression of HGF-induced signals and cell proliferation [14, 22]. In our study, we first identified that suppression of IFI44L leads to the activation of Met/Src pathway. Thus, the phenomenon that suppression of IFI44L promotes cancer stemness, migration, invasion, and pulmonary metastasis in HCC cells and overexpression of IFI44L results in restoring chemosensitivity observed in our study might be regulated via affecting Met/Src signaling pathway. Our study has demonstrated that IFI44L as a novel tumor suppressor in HCC through perturbation of Met/Src signaling. Clinical relevance of low expression of IFI44L with larger tumor size, disease relapse, advanced stages, and poor outcomes in HCC patients was also first identified. The IFI44L could serve as a prognostic biomarker and a promising therapeutic target in the treatment of HCC. Wei-Chieh Huang and Shiao-Lin Tung contributed equally to this work. This study was funded by grants MOST 103–2314-B-442-002-MY3 and MOST 106–2314-B-442-001-MY3 from Ministry of Science and Technology, Taiwan; RB17004 from Show Chwan Memorial Hospital, Taiwan. The funding bodies had no role in the design of the study and collection, analysis, and interpretation of data and in writing the manuscript. Conception and design: WCH and PYC. Development of methodology: WCH and SLT. Acquisition of data: WCH, SLT, and PYC. Analysis and interpretation of data: WCH, PMC, SLT and YLC. Study supervision: PYC. All authors read and approved the final manuscript. Ethics approval was obtained from the Changhua Christian Hospital (CCH IRB No. 120504), Taiwan. The Written informed consent was provided by participants to be included in the study. The animal experiment protocols (NHRI-IACUC-104045A) were reviewed and approved by the Institutional Animal Care and Use Committee of National Health Research Institutes.